Bring the perfect amount of fun, adventure and style to your child's room with the Your Zone Twin Over Full Bunk Bed. The Brady Twin over Full Bunk Bed is a space saving solution that both parents and children alike will love. This stack-able bunk bed is made of solid pine wood and includes top twin bed frame, bottom full bed frame and rails. Elegance and function combine to give this contemporary wood bunk bed a striking appearance. 2-1/2 In. straight post bunkbed 26 webbed wood slats included. This Casual Style Twin/Full Bunk Bed Combination Features Two Storage Drawers for added Functionality. Bunk Bed Size: 79 x 57 x 66 In. (H).Ladder Is Not As Shown. It Extends From The Top Bunk To The Floor. See Item #460193 (CO) For An Example. This Oak Finished Bunk Bed is a Great Combo. Twin on Top or You Can Make it into Twin Single Bed. Bunk Bed Size: 81 x 60 x 65 In. (H). The Rochford Twin/Full Bunk Bed Features A Twin Size Upper Bunk And A Full Size Bottom Bunk In Pine Finish. This Twin/Full Bunk Bed Is Made Of Solid Pine In A Dark Cherry Finish. Features Includes A Front Ladder. Strong Construction. 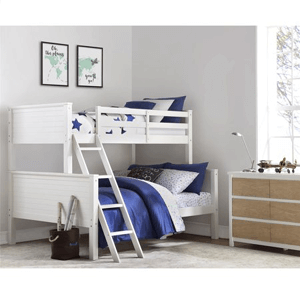 The Cherry Twin over Full Bunk Bed from Coaster is great for any kids bedroom. Solid Wood Twin/Full Bunk Bed with 3-Drawers.